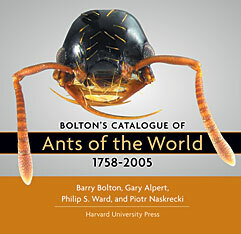 Barry Bolton’s New General Catalogue of the Ants of the World, published in 1995, was the first attempt in more than one hundred years to collect all taxonomic decisions for ants worldwide, including extinct as well as extant taxa. One reviewer said of it, “There is no longer an excuse for nomenclatural mistakes, since all past decisions are recorded here. All future revisions will use this reference as a point of departure.” Now Gary Alpert, Philip Ward, and Piotr Naskrecki have joined Bolton to produce a completely updated and even more comprehensive edition of Bolton’s monumental work. The new edition incorporates all taxonomic papers—from 1758 through 2005—on 14,550 species and subspecies of ants. The CD allows every valid species name to be linked to the primary taxonomic citation and to all subsequent taxonomic literature that is relevant. As was true of the earlier edition, both fossil and living ants are covered from the species level up through the subgenus, genus, tribe, and subfamily rank. Each species description also records the caste—worker, queen, male, soldier, or minor worker—which was described, along with the page number and any illustrations. Ant larvae descriptions and chromosome papers can be searched within the data set. The ant’s type locality on a country-by-country basis can also be queried from this catalogue.